Articles Tagged "Climate Cognitive Dissonance"
Joe Bastardi: Inconvenient Truth: CO2 Disconnect With Global Temperature Continues! With climate change a huge issue this election season, we should review the latest facts on the matter. 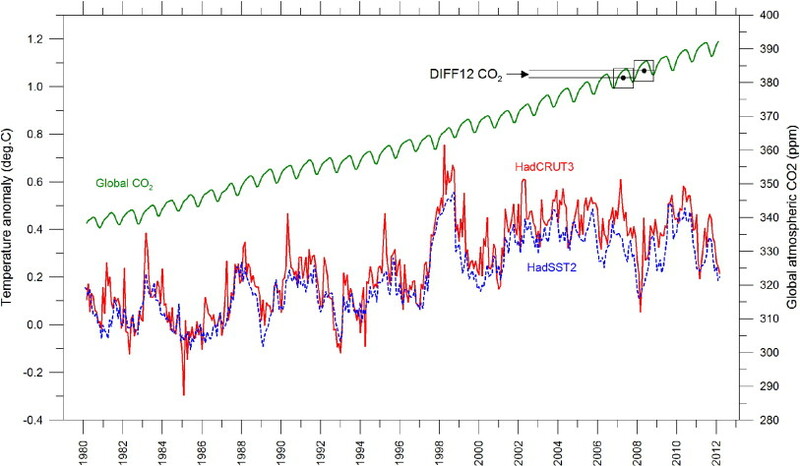 In this chart, CO2 continues its rise. The global temperatures, however, have not only leveled off, they have begun to fall. This result is in line with natural climate cycle theory. If the admission to the school of your choice, be it Cornell, or lets say Columbia or Harvard, depended on you answering this question -- "Given the facts presented in the chart above, is CO2 driving the Earth’s temperature?" -- how would you answer it? Last week, Gallup announced the results of their latest survey on Americans and evolution. The numbers were a stark blow to high-school science teachers everywhere: forty-six per cent of adults said they believed that “God created humans in their present form within the last 10,000 years.” Only fifteen per cent agreed with the statement that humans had evolved without the guidance of a divine power. What’s most remarkable about these numbers is their stability: these percentages have remained virtually unchanged since Gallup began asking the question, thirty years ago. In 1982, forty-four per cent of Americans held strictly creationist views, a statistically insignificant difference from 2012. Furthermore, the percentage of Americans that believe in biological evolution has only increased by four percentage points over the last twenty years. Such poll data begs the question: Why are some scientific ideas hard to believe in? What makes the human mind so resistant to certain kinds of facts, even when these facts are buttressed by vast amounts of evidence? It might be hard to believe with the snow falling outside but 2010 was globally the hottest year on record, according to the Met Office. Despite the coldest start to the year in Britain for 30 years and the recent freeze, the world as a whole has been 0.94F (0.52C) warmer than the 30 year average of 57.2F (14C). The national weather service said it was equal with 1998, when an El Nino in the Pacific made the world warmer. This time the weather pattern in the southern oceans has actually cooled the world, meaning the high temperatures are more likely than ever to be as a result of man made global warming. The cooling pattern known as La Nina will increase into next year making it slightly cooler than recent years. But again, because the level of global warming is so high, 2011 is still expected to be warmer than average. “Why did we slide into chaos?” asks the front page of today’s Telegraph. It was prompted by the wrath of Transport Secretary Philip Hammond who apparently can’t understand why it is that Britain has been caught out – yet again – by snowy weather. “There are lessons to be learnt from our performance in every bout of bad weather and it is important that we learn those now,” he says. All right, Phil. Your wish is my command. For considerably less than you paid the RAC’s David Quarmby last month for a review of weather-related transport policy, I can tell you what the problem is: The Met Office. There is a large cognitive dissonance required to be a true AGW believer, hence the comparison to religious beliefs. Take, for instance, the ability to simultaneously acknowledge that CO2 levels have been 10 to 20 times higher than the present during multiple periods of Earth's history without causing a 'tipping point' of no return, while retaining the belief that CO2 levels 10 to 20 times less are causing a 'tipping point' now. In fact, an entire ice age came and went with CO2 levels about 11 times higher than the present throughout the Ordovician period shown in the graphic above. The latest eco-scare-alert notes that Antarctica abruptly transitioned from a warm, subtropical hothouse to the present solid ice sheet during a period when CO2 levels exceeded those of today by 10 times. We have had several people contact us concerning our expression "Climate Cognitive Dissonance", this has been used recently with the following CO2Sceptics article Climate change could be even worse than feared - yes, it's true!. UK Professor Emeritus of Biogeography, Philip Stott of the University of London highlighted this psychological condition in two of his articles, Cognitive Dissonance and More On Cognitive Dissonance and we simply added the "Climate" part as it seemed the appropriate thing to do, as far as some of the media are concerned. We could have also mentioned the phrase "Man Made Climate Cognitive Dissonance" or "Man Made Global Warming Cognitive Dissonance", but we thought it was best to keep it headed as short as it could be, and who knows at a later time when this rather silly situation has come to a head with "Global Cooling" some brainy psychologist may even use the same term, lets all hope a lesson can be learnt from this event and it will be over soon. At this moment in time regretfully, the media are still very keen to report that world temperatures are becoming warmer when in fact they are becoming cooler, and it's little wonder when you read these articles by Philip Stott, that it fits the psychological condition described. Climate change could be even worse than feared - yes, it's true! The AGW alarmist stories are getting more and more desperate, take a look at the AFT latest Climate change could be even worse than feared. The article has gone as far as you can go when the world temperatures have fallen for 10 years in a row whist CO2 has continued to rise. Yes "Climate Change" is as worse then feared, there IS institutionalized "Climate Cognitive Dissonance" in the propaganda machine. By UK Professor Emeritus of Biogeography Philip Stott of the University of London. Throughout history, many competing cults have attempted to predict dire catastrophes for the Earth. With respect to these cults, the key psychological and sociological question is: “What happens when the predictions fail?” Following on from yesterday’s post [see: ‘Cognitive Dissonance’, August 19], in which I analysed the growing gap between a hot media obsessed with ‘global warming’ disasters and a world in which the climate is currently cooling, I thought it might be helpful to explore the phenomenon of ‘cognitive dissonance’ further. I must ask a very serious and urgent question of our media. Why do you continue to talk glibly about current climate ‘warming’ when it is now widely acknowledged that there has been no ‘global warming’ for the last ten years, a cooling trend that many think may continue for at least another ten years? How can you talk of the climate ‘warming’ when, on the key measures, it isn’t? And now a leading Mexican scientist is even predicting that we may enter another ‘Little Ice Age’ - a ‘pequeña era de hielo’. Such media behaviour exhibits a classic condition known as ‘cognitive dissonance’. This is experienced when belief in a grand narrative persists blindly even when the facts in the real world begin to contradict what the narrative is saying. Sadly, our media have come to have a vested interest in ‘global warming’, as have so many politicians and activists. They are terrified that the public may begin to question everything if climate is acknowledged, on air and in the press, not to be playing ball with their pet trope.